Description: Shortly after Hurricane Matthew hit the East Coast last month, drone pilot Quavas Hart took to the skies. He flew his DJI Phantom 3 Professional around his town of Fayetteville, North Carolina, to assess the damage from the storm. Hart shared the images of the flooded neighborhood on social media. It didn’t take long before a man halfway across the country reached out to Hart, asking for help. After confirming that the man’s brother was indeed in trouble, Hart returned to the site of his previous flight and flew his drone again. After locating the man trapped in his house, Hart then led local rescuers to the scene — with his drone. The man, Chris Williams, and his dog, Lana, were both rescued thanks in large part to Hart and his drone. Hart, who served 10 years in the Army, has since done numerous interviews about the rescue. With his drone rescue mission in the spotlight, Hart hopes he can use this experience to highlight the positives of drones. 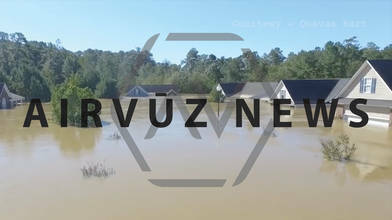 Follow AirVūz News for all the latest updates in the drone community!